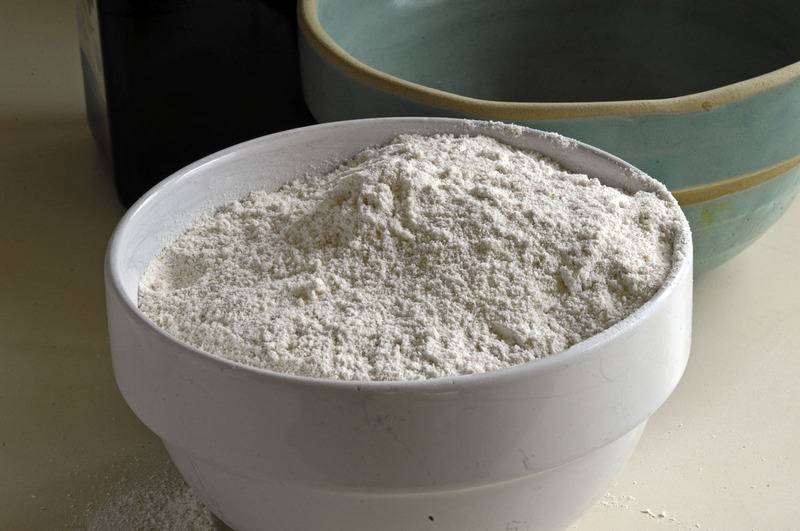 I have written before about my experiments with home-ground barley flour: When is it a good substitute for wheat, and when is it not? Barley flour makes a very good pie crust. It’s good, I would say, but not perfect. Made with the usual amount of oil, the barley-flour crust is too crumbly. But, particularly for the parts of the crust that stand above the pie and are exposed to the heat of the oven, the tasty toastiness of the barley crust is fantastic. For my next experiment with barley-flour pie crusts, I will reduce the amount of oil in the crust and compensate with water. Over the next few days, I will eat this whole pie. So I wanted it to be as healthy and low-calorie as possible. I reduced the amount of sugar by half — from three-quarters of a cup to half a cup. It still tastes like a desert. But the reduced sugar actually enhances the pumpkin taste. And the pumpkin taste is very good. 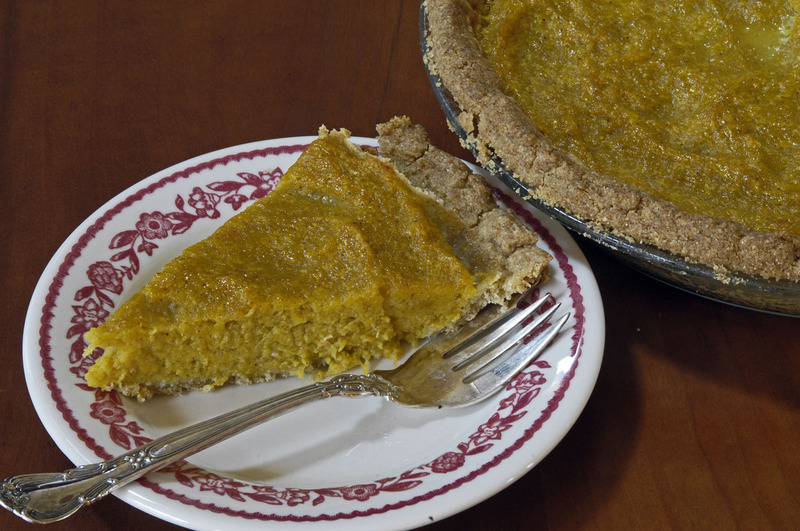 I can even imagine a savory vegetable pie based on pumpkin with no sugar at all. These are my organic homegrown pumpkins. I still have lots of pumpkins left from the 2018 pumpkin crop, stored in baskets under the stairs. Something about the barley taste is very old-fashioned. The taste of toasted barley is so good that I Googled for “toasted barley flour,” thinking that it surely must be a thing. Sure enough, toasted barley flour is a staple of Tibetan cuisine. The old-fashioned taste of the barley and the reduced sugar produced a kind of austere pie that actually was appealing in its austerity. Pumpkins are a New World food. But if some monks in Gaul in the 13th Century had some pumpkin pie, then this is what I’d imagine it would taste like. One of my little pumpkins after baking. I’ll scoop out the flesh and give the rest to the chickens. This was written by daltoni. Posted on Wednesday, January 23, 2019, at 5:03 pm. Filed under Food. Bookmark the permalink. Follow comments here with the RSS feed. Trackbacks are closed, but you can post a comment. Hi Henry… I cut the pumpkin in half, clean out the seeds, and then put the pumpkin back together. I bake it for about an hour at 350 or 375 degrees. After the pumpkin cools, scrape out the flesh with a spoon. 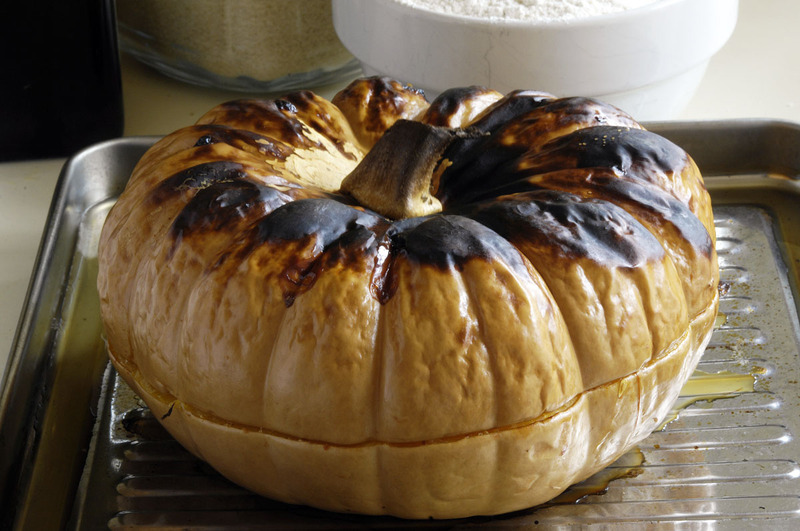 Pumpkins vary in the amount of water they contain, but you need to contrive to remove as much water as possible. I let the scooped pumpkin sit in a bowl for a while, then kind of squeeze-pour out the water that has settled to the bottom of the bowl. My pie recipe is simple: pumpkin, sugar, two eggs, a teaspoon of cinnamon, and a half teaspoon of nutmeg. I’m very proud of the fact that I have never used canned pumpkin in my life. Working with real pumpkins is too much fun for that.